This is a quick and easy recipe that never fails to please even picky eaters. 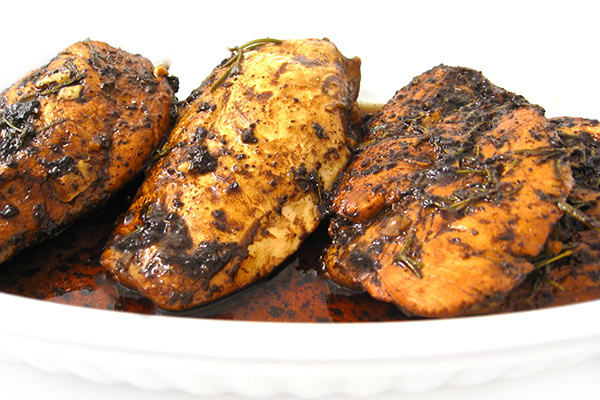 Making a simple reduction sauce using balsamic vinegar, garlic and fresh rosemary creates a flavorful marinade for the chicken. It smells wonderful when baking and tastes even better when ready! Each serving has 169 calories, 3 grams fat and 4 Weight Watchers POINTS PLUS. Serve with steamed veggies, baked potatoes and mash some of the delicious sauce (marinade) into each potato. 1. To make marinade: In a small pot, add vinegar, oil, rosemary, garlic, salt and pepper and mix until combined. Bring up to a boil, turn heat down to medium and simmer until reduced in half, about 3 minutes. Place in refrigerator to cool for about 15 minutes. For a quicker chill, place in freezer for about 5 minutes. 2. Coat a 9 x 9 inch baking dish with cooking spray. Place chicken in baking dish and pour cooled marinade over chicken. Refrigerate for 30 minutes. Can be refrigerated overnight. 3. Preheat oven to 400 degrees. Take dish out of refrigerator, cover with foil and baked in marinade. Bake for about 35 minutes until chicken is cooked thoroughly. 4. Remove chicken to serving plate. Pour cooked marinade into a small pot. Add 2 tablespoon of balsamic vinegar. Cook a few minutes until the sauce has thickened a bit. Pour some of the sauce over chicken and serve. 5. Use the leftover sauce drizzled in a baked potato, if desired.